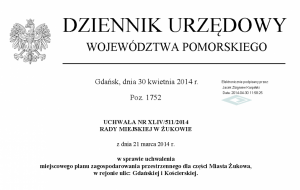 This small 2.5 hectare zoning master plan was prepared for Żukowo, Poland. We worked under pressure of time to deliver within less than 9 months from the first draft to formal publishing the document. It was crucial to have this regulation in place to build a municipal crisis management centre. The difficulty in this process to reassess the flooding threats and meet requirements of protected areas of historical and cultural values. Finally all the documents were approved and the required centre was built.